Jack Trimble was born in 1947 in Tampa, Florida. He enlisted in the U.S. Air Force Reserve on June 14, 1965, and went on active duty to attend the U.S. Air Force Academy Preparatory School from July 15, 1965, to May 13, 1966. He reverted to reserve status on May 14, 1966, and received an honorable discharge to accept his appointment to the U.S. Air Force Academy on June 26, 1966. After receiving his commission on June 3, 1970, Lt Trimble completed Undergraduate Navigator Training and was awarded his navigator wings at Mather AFB, California, in June 1971, followed by Weapon Systems Officer (WSO) training and F-4 Phantom II Combat Crew Training at George AFB, California, from July 1971 to February 1972. His first assignment was as an F-4 WSO with the 13th Tactical Fighter Squadron at Udorn Royal Thai AFB, Thailand, from April 1972 until he was forced to eject over North Vietnam and was taken as a Prisoner of War on December 27, 1972. After spending 93 days in captivity, Lt Trimble was released during Operation Homecoming on March 29, 1973, and was briefly hospitalized to recover from his injuries at Maxwell AFB, Alabama. He entered Undergraduate Pilot Training at Williams AFB, Arizona, in December 1973, was awarded his pilot wings there in February 1975, and then attended F-4 Combat Crew Training at Luke AFB, Arizona, from February to December 1975. Capt Trimble next served as an F-4 pilot with the 335th Tactical Fighter Squadron of the 4th Tactical Fighter Wing at Seymour Johnson AFB, North Carolina, from January 1976 to December 1977, followed by service as an F-4 pilot with the 43rd Tactical Fighter Squadron at Elmendorf AFB, Alaska, from December 1977 to January 1979. He served as a Studies Officer, Chief of the Capabilities and Force Integration Division, and then as Chief of the Concepts and Requirements Division with Headquarters Alaskan Air Command at Elmendorf AFB from January 1979 to February 1981, and then as an AT-38B Talon Lead in Fighter Training instructor pilot, Chief of the Aircrew Training Branch, and then as Chief of the Operations Plans Division with the 479th Tactical Training Wing at Holloman AFB, New Mexico, from February 1981 to May 1984. 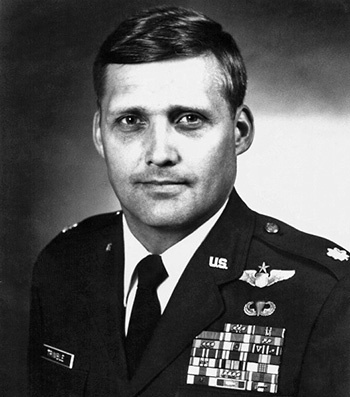 Maj Trimble next served as Air Officer Commanding of Cadet Squadron Seventeen at the U.S. Air Force Academy from June 1984 to June 1986, followed by service as an F-4E pilot and as Special Assistant to the Commander of the 69th Tactical Fighter Squadron of the 347th Tactical Fighter Wing at Moody AFB, Georgia, from June 1986 to November 1987. During this time, Lt Col Trimble deployed to Saudi Arabia to serve as Vice Detachment Commander for Operation Elf One (European Liaison Force One) during the Iran-Iraq War from March to September 1987. His final assignment was as Director of Operations for the 8th Air Support Operations Group at Moehringen Army Installation, Germany, from December 1987 until his retirement from the Air Force on December 31, 1990. After retiring from the Air Force, Jack flew Boeing 727s, Airbus 300s, McDonnell Douglas DC-10s, and Boeing 757s for FedEx from March 1991 until his retirement in November 2011. First Lieutenant Jack R. Trimble distinguished himself by heroism while participating in aerial flight as an F-4D Weapon Systems Officer while stationed at Udorn Royal Thai Air Force Base, Thailand, on 18 July 1972. On that date, Lieutenant Trimble participated in a flight of four tactical fighter aircraft on an air superiority mission in support of a friendly strike force over the Hanoi area of North Vietnam. When a flight of hostile aircraft attacked the earlier air superiority flight during its egress from the target area in a low fuel state, Lieutenant Trimble, with complete disregard for his own safety, participated in the engagement of these hostile aircraft. The excellent support given to his flight leader contributed directly to the downing of a hostile aircraft after a high speed, low altitude chase. The outstanding heroism and selfless devotion to duty displayed by Lieutenant Trimble reflect great credit upon himself and the United States Air Force.